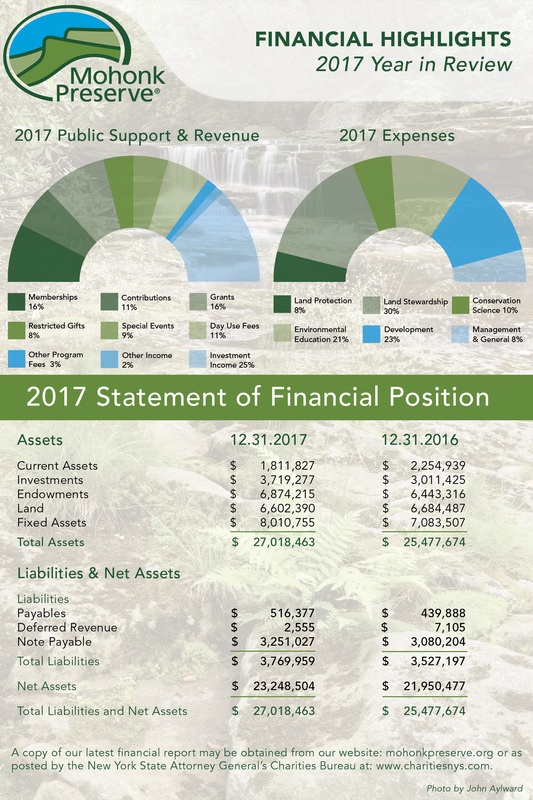 We are deeply grateful for your generous support which allows us to safeguard the treasured Mohonk Preserve, an area rich in natural beauty and geological wonder, but so much more than just a pretty place. With your help, the Preserve offers people many roads to outdoor education, exploration and discovery. 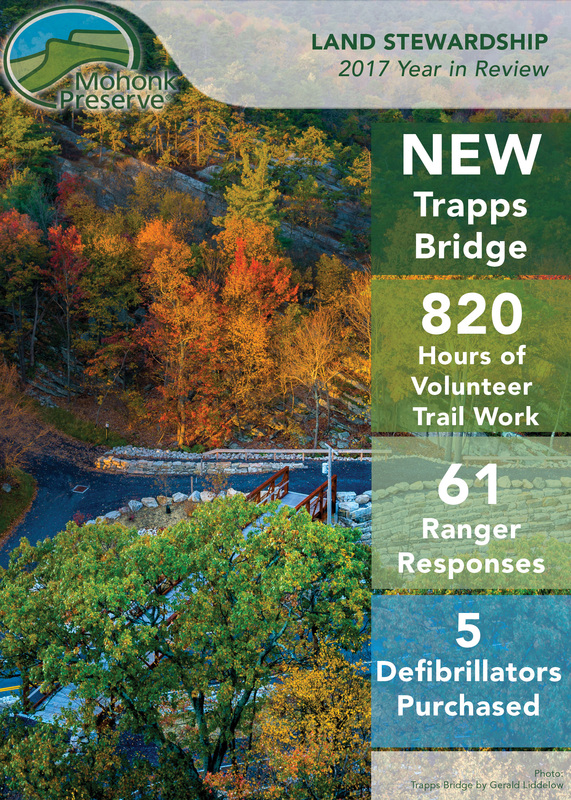 From inner-city schoolchildren, local citizen naturalists and volunteer land stewards, to rock climbers, hikers and cyclists, a spark of inspiration from experiences on the Preserve can result in a lifetime of passion for saving our environment. 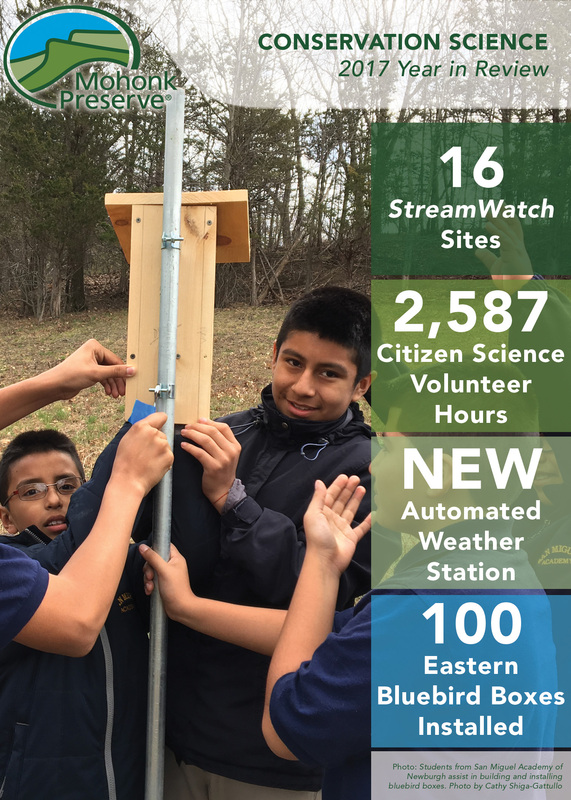 Your giving supports programs like school field studies, teen Junior Rangers, Youth Nature Ambassadors, Young Explorers summer day camps, college internships, citizen science initiatives like Climate Trackers, the Bluebird Trail, and StreamWatch, and advanced training for our Ranger search and rescue team, among so many more. 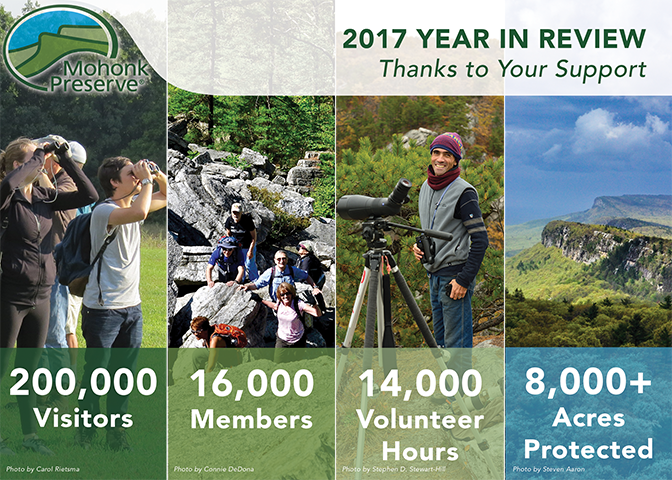 These programs provide access to the Preserve’s 8,000 acres and bring people from diverse backgrounds and interests together to work on conservation, while forming an unbreakable bond with nature in their lives. People come to the Preserve for many different reasons, but we all agree we must protect and sustain it for future generations. Many roads – with one common mission around a resource we love. You’re the folks who make it all possible and we are proud to partner with you in this important work as we continue in our 55th year of saving the land for life. 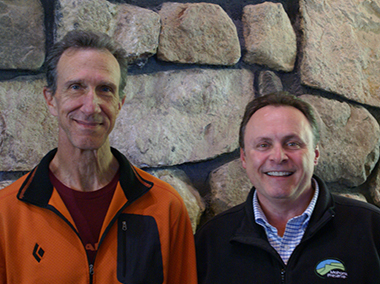 Mohonk Preserve is grateful to all those who contribute in-kind gifts and services, and those who support our Auction. This generosity enables us to carry out our mission. These lists represent gifts received between January 1, 2017 and December 31, 2017. To view and download the infographics above as a PDF, click here. 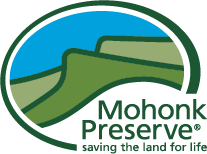 With over 8,000 acres of cliffs, forests, fields, ponds, streams, and other unique and beautiful places, Mohonk Preserve is the largest member-and visitor-supported nature preserve in New York State. 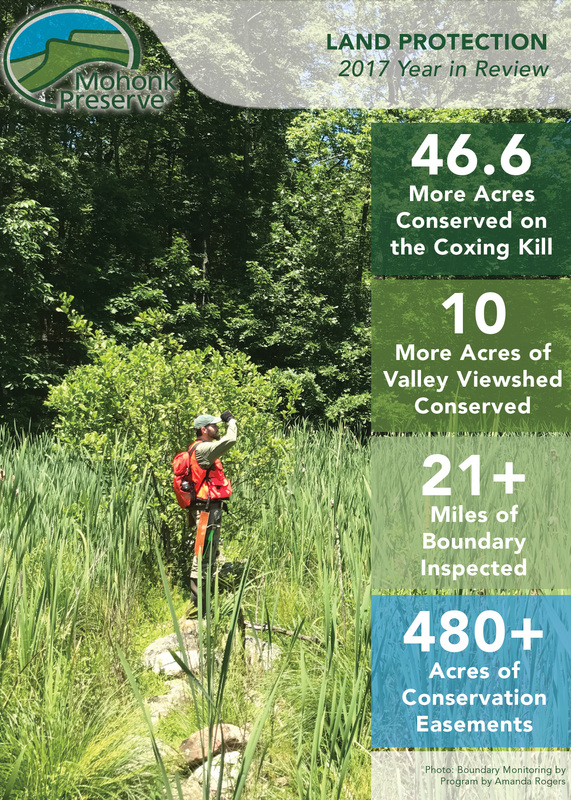 Our mission is to protect the Shawangunk Mountains region and inspire people to care for, enjoy, and explore their natural world. 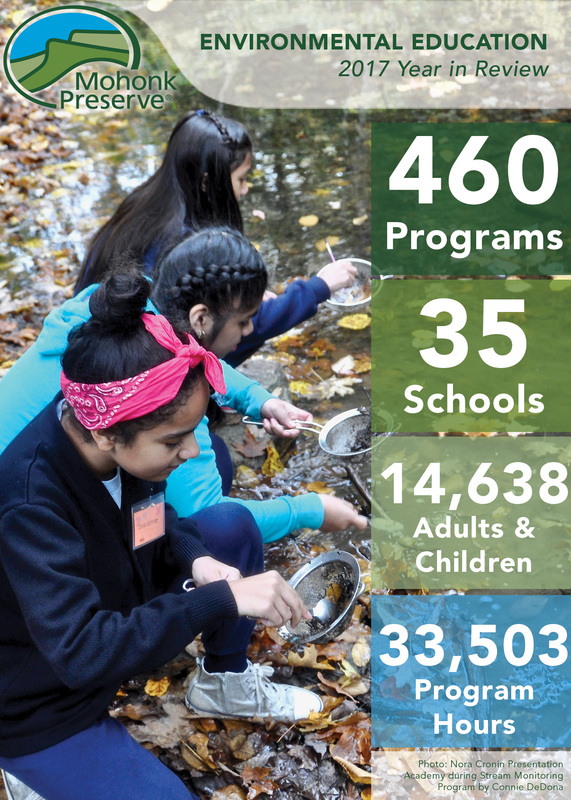 Education - We serve over 14,000 children and adults each year through our award-winning innovative outdoor education programs. 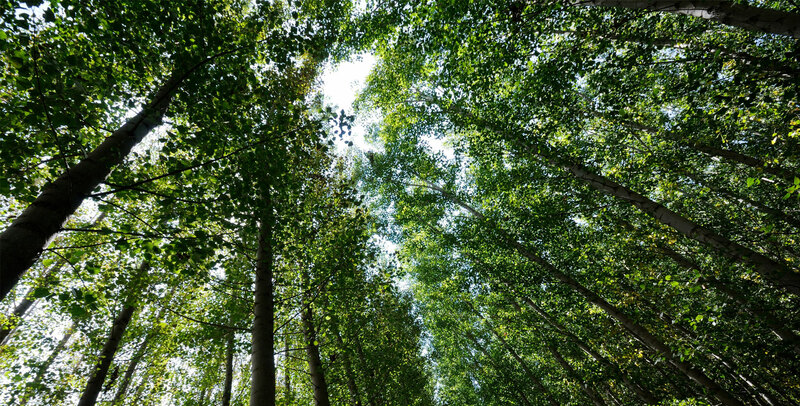 Land Protection - We protect key recreational areas, fragile habitats, and scenic viewsheds. 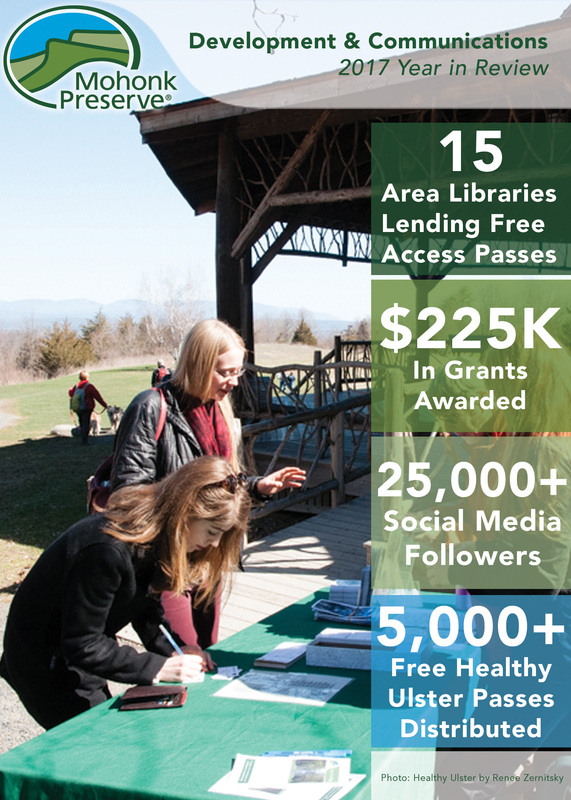 Land Stewardship - We manage over 8,000 acres and provide a safe, participatory experience in nature for over 200,000 visitors each year. Conservation Science - We use the latest scientific techniques and a century of natural history data to monitor and manage the diverse ecosystems on the ridge. A copy of our latest financial report may be obtained here or by writing to the New York State Office of the Attorney General, Department of Law, Charities Bureau, 120 Broadway, New York, NY 10271.